The Stream and its subclasses, a subclass of the Music21Object, is the fundamental container of offset-positioned notation and musical elements in music21. Common Stream subclasses, such as the Measure and Score objects, are defined in this module. This is the fundamental container for Music21Objects; objects may be ordered and/or placed in time based on offsets from the start of this container. As a subclass of Music21Object, Streams have offsets, priority, id, and groups. Streams may be embedded within other Streams. As each Stream can have its own offset, when Streams are embedded the offset of an element is relatively only to its parent Stream. The flat property provides access to a flat representation of all embedded Streams, with offsets relative to the top-level Stream. The Stream elements attribute returns the contents of the Stream as a list. Direct access to, and manipulation of, the elements list is not recommended. Instead, use the host of high-level methods available. The Stream, like all Music21Objects, has a music21.duration.Duration that is usually the “release” time of the chronologically last element in the Stream (that is, the highest onset plus the duration of any element in the Stream). The duration, however, can be “unlinked” and explicitly set independent of the Stream’s contents. The first element passed to the Stream is an optional list, tuple, or other Stream of music21 objects which is used to populate the Stream by inserting each object at its offset property. Other arguments and keywords are ignored, but are allowed so that subclassing the Stream is easier. beat returns None for a Stream. May change to “” soon. A very important read-only property that returns a new Stream that has all sub-containers “flattened” within it, that is, it returns a new Stream where no elements nest within other elements. If you look back to our simple example of four notes above, you can see that the E (the first note in part2) comes before the D (the second note of part1). This is because the flat stream is automatically sorted like all streams are by default. The next example shows how to change this behavior. Returns the maximum of all Element offsets plus their Duration in quarter lengths. This value usually represents the last “release” in the Stream. Stream.duration is usually equal to the highestTime expressed as a Duration object, but it can be set separately for advanced operations. The Stream iterator, used in all for loops and similar iteration routines. This method returns the specialized music21.stream.StreamIterator class, which adds necessary Stream-specific features. Generally you don’t need this, just iterate over a stream, but it is necessary to add custom filters to an iterative search before iterating. Get the start time of the Element with the lowest offset in the Stream. The notes property of a Stream returns an iterator that consists only of the notes (that is, Note, Chord, etc.) found in the stream. This excludes Rest objects. The notesAndRests property of a Stream returns a StreamIterator that consists only of the GeneralNote objects found in the stream. The new Stream will contain mostly notes and rests (including Note, Chord, Rest) but also their subclasses, such as Harmony objects ( ChordSymbols , FiguredBass ), SpacerRests etc. .notesAndRests removes the KeySignature object but keeps the Rest . The same caveats about Stream classes and .flat in .notes apply here. Returns all Pitch objects found in any element in the Stream as a Python List. Elements such as Streams, and Chords will have their Pitch objects accumulated as well. For that reason, a flat representation is not required. Pitch objects are returned in a List, not a Stream. This usage differs from the .notes property, but makes sense since Pitch objects usually have by default a Duration of zero. This is an important difference between them and music21.note.Note objects. key.Key objects are subclasses of Scales, which DO have a .pitches list, but they are specifically exempt from looking for pitches, since that is unlikely what someone wants here. N.B., TODO: This may turn to an Iterator soon. Since all elements with a .pitches list are returned and streams themselves have .pitches properties (the docs you are reading now), pitches from embedded streams are also returned. Flattening a stream is not necessary. Whether this is a feature or a bug is in the eye of the beholder. Returns a list where each element is a dictionary consisting of the ‘offsetSeconds’ in seconds of each element in a Stream, the ‘duration’ in seconds, the ‘endTimeSeconds’ in seconds (that is, the offset plus the duration), and the ‘element’ itself. Also contains a ‘voiceIndex’ entry which contains the voice number of the element, or None if there are no voices. Returns a flat-like Stream representation. Stream sub-classed containers, such as Measure or Part, are retained in the output Stream, but positioned at their relative offset. Return a Stream containing all Variant objects in this Stream. Get or set the atSoundingPitch status, that is whether the score is at concert pitch or may have transposing instruments that will not sound as notated. Valid values are True, False, and ‘unknown’. 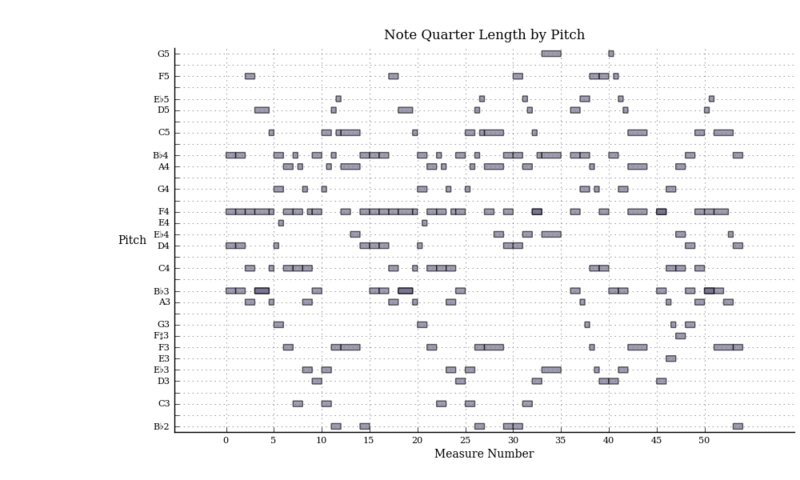 Note that setting “atSoundingPitch” does not actually transpose the notes. See toSoundingPitch() for that information. Returns the total duration of the Stream, from the beginning of the stream until the end of the final element. May be set independently by supplying a Duration object. .elements is a list representing the elements contained in the Stream. Directly getting, setting, and manipulating this list is reserved for advanced usage. Instead, use the the provided high-level methods. In other words: Don’t use unless you really know what you’re doing. Treat a Stream like a list! When setting .elements, a list of Music21Objects can be provided, or a complete Stream. If a complete Stream is provided, elements are extracted from that Stream. This has the advantage of transferring offset correctly and geting _endElements. Get or set the final barline of this Stream’s Measures, if and only if there are Measures defined as elements in this Stream. This method will not create Measures if non exist. Setting a final barline to a Stream that does not have Measure will raise an exception. This property also works on Scores that contain one or more Parts. In that case a list of barlines can be used to set the final barline. A key.Key object can be used instead of key.KeySignature, since the former derives from the latter. Get or set the Metadata object found at the beginning (offset 0) of this Stream. Get or set the duration of this Stream in seconds, assuming that this object contains a MetronomeMark or MetricModulation. For any Variant objects defined in this Stream (or selected by matching the group parameter), replace elements defined in the Variant with those in the calling Stream. Elements replaced will be gathered into a new Variant given the group ‘default’. If a variant is activated with .replacementDuration different from its length, the appropriate elements in the stream will have their offsets shifted, and measure numbering will be fixed. If matchBySpan is True, variants with lengthType ‘replacement’ will replace all of the elements in the replacement region of comparable class. If matchBySpan is False, elements will be swapped in when a match is found between an element in the variant and an element in the replcement region of the string. >>> sStr   = "d4 e4 f4 g4   a2 b-4 a4    g4 a8 g8 f4 e4    d2 a2              "
>>> v1Str  = "              a2. b-8 a8 "
>>> v2Str1 = "                                             d4 f4 a2 "
>>> v2Str2 = "                                                      d4 f4 AA2 "
>>> sStr += "d4 e4 f4 g4    a2 b-4 a4    g4 a8 b-8 c'4 c4    f1"
>>> s.makeMeasures(inPlace=True) # maybe not necessary? After a variant group has been activated, the regions it replaced are stored as variants with the group ‘default’. It should be noted that this means .activateVariants should rarely if ever be used on a stream which is returned by activateVariants because the group information is lost. Add the group to the groups attribute of all elements. if classFilter is set then only those elements whose objects belong to a certain class (or for Streams which are themselves of a certain class) are set. Returns a new Stream of elements in this stream that sound at the same time as el , an element presumably in another Stream. The offset of this new Stream is set to el’s offset, while the offset of elements within the Stream are adjusted relative to their position with respect to the start of el. Thus, a note that is sounding already when el begins would have a negative offset. The duration of otherStream is forced to be the length of el – thus a note sustained after el ends may have a release time beyond that of the duration of the Stream. As above, elStream is an optional Stream to look up el’s offset in. Use this to work on an element in another part. The method always returns a Stream, but it might be an empty Stream. Runs a particular analytical method on the contents of the stream to find its ambitus (range) or key. Some of these methods can take additional arguments. For details on these arguments, see analyzeStream(). Add a Music21Object (including another Stream) to the end of the current Stream. If given a list, will append each element in order after the previous one. The “end” of the stream is determined by the highestTime property (that is the latest “release” of an object, or directly after the last element ends). Since notes are not embedded in Elements here, their offset changes when they are added to a stream! TODO(bug): Appending a Clef after a KeySignature, or a Measure after a KeySignature, etc. will not cause sorting to be re-run. For each element in self, creates an interval.Interval object in the element’s editorial that is the interval between it and the element in cmpStream that is sounding at the moment the element in srcStream is attacked. For each element in self, creates an interval.Interval object in the element’s editorial that is the interval between it and the previous element in the stream. Thus, the first element will have a value of None. DEPRECATED sometime soon. A replacement to come presently. Given a number greater than zero, multiplies the current quarterLength of the duration of each element by this number as well as their offset and returns a new Stream. Or if inPlace is set to True, modifies the durations of each element within the stream. A number of .5 will halve the durations and relative offset positions; a number of 2 will double the durations and relative offset positions. Note that the default for inPlace is the opposite of what it is for augmentOrDiminish on a Duration. This is done purposely to reflect the most common usage. Returns a two-element tuple of the beat and the Measure object (or the first one if there are several at the same offset; unlikely but possible) for a given offset from the start of this Stream (that contains measures). Recursively searches for measures. Note that this method assumes that all parts have measures of consistent length. If that’s not the case, this method can be called on the relevant part. This algorithm should work even for weird time signatures such as 2+3+2/8. Adapted from contributed code by Dmitri Tymoczko. With thanks to DT. Create a chordal reduction of polyphonic music, where each change to a new pitch results in a new chord. If a Score or Part of Measures is provided, a Stream of Measures will be returned. If a flat Stream of notes, or a Score of such Streams is provided, no Measures will be returned. If using chordify with chord symbols, ensure that the chord symbols have durations (by default the duration of a chord symbol object is 0, unlike a chord object). If harmony objects are not provided a duration, they will not be included in the chordified output pitches but may appear as chord symbol in notation on the score. To realize the chord symbol durations on a score, call music21.harmony.realizeChordSymbolDurations() and pass in the score. This functionlaity works by splitting all Durations in all parts, or if multi-part by all unique offsets. All simultaneous durations are then gathered into single chords. If addPartIdAsGroup is True, all elements found in the Stream will have their source Part id added to the element’s pitches’ Group. These groups names are useful for partially “de-chordifying” the output. If the element chordifies to a Chord object, then the group will be found in each Pitch element’s .groups in Chord.pitches. If the element chordifies to a single Note then .pitch.groups will hold the group name. The addTies parameter currently does not work for pitches in Chords. If toSoundingPitch is True, all parts that define one or more transpositions will be transposed to sounding pitch before chordification. True by default. Returns the container in a hierarchy that this element belongs to. For instance, assume a Note (n) is in a Measure (m1) which is in a Part, in a Score (s1), and the Note is also in another hierarchy (say, a chordified version of a Score, s2). if s1.containerInHierarchy(n) is called, it will return m1, and (unless setActiveSite is False) will return the Measure, m1, that contains the note. If it cannot be found, then None is returned. Return the offset as an opFrac (float or Fraction) from the offsetMap. highly optimized for speed. If stringReturns is True then returns like ‘highestOffset’ are allowed. Performance note: because it will not follow derivation chains, and does not need to unwrap a weakref, this method should usually be about 3x faster than element.getOffsetBySite(self) – currently 600ns instead of 1.5 microseconds. Expand this Stream with repeats. Nested repeats given with Repeat objects, or repeats and sections designated with RepeatExpression objects, are all expanded. This method always returns a new Stream, with deepcopies of all contained elements at all levels. Uses the Expander object in the repeat module. Create a multi-part extraction from a single polyphonic Part. Currently just runs voicesToParts() but that will change as part explosion develops, and this method will use our best available quick method for part extraction. Given a Stream and an object class name, go through the Stream and find each instance of the desired object. The time between adjacent objects is then assigned to the duration of each object. The last duration of the last object is assigned to extend to the end of the Stream. If inPlace is True, this is done in-place; if inPlace is False, this returns a modified deep copy. Extend the Duration of elements specified by objName; then, collect a dictionary for every matched element of objName class, where the matched element is the value and the key is the (start, end) offset value. Connect any adjacent pitch space values that are the same with a Tie. Adjacent pitches can be Chords, Notes, or Voices. If ignoreRests is True, rests that occur between events will not be considered in matching pitches. The pitchAttr determines the pitch attribute that is used for comparison. Any valid pitch attribute name can be used. Extracts elements around the given element within (before) quarter notes and (after) quarter notes (default 4), and returns a new Stream. Returns a list of consecutive pitched Notes in a Stream. A single “None” is placed in the list at any point there is a discontinuity (such as if there is a rest between two pitches), unless the noNone parameter is True. The skipUnisons parameter uses the midi-note value (.ps) to determine unisons, so enharmonic transitions (F# -> Gb) are also skipped if skipUnisons is true. We believe that this is the most common usage. However, because of this, you cannot completely be sure that the x.findConsecutiveNotes() - x.findConsecutiveNotes(skipUnisons=True) will give you the number of P1s in the piece, because there could be d2’s in there as well. See test.TestStream.testFindConsecutiveNotes() for usage details. This example is adapted from the tutorials/Examples page. Returns either (1) a Stream containing Elements (that wrap the None object) whose offsets and durations are the length of gaps in the Stream or (2) None if there are no gaps. If there is more than one voice, and a voice has no elements, remove that voice. If there is only one voice left that has elements, place those elements in the parent Stream. If force is True, even if there is more than one Voice left, all voices will be flattened. Changed in v. 5 – inPlace is default False and a keyword only arg. Collect all Clef objects in this Stream in a list. Optionally search the activeSite Stream and/or contexts. Given an offset, find the element at this offset, or with the offset less than and nearest to. Return one element or None if no elements are at or preceded by this offset. If the classList parameter is used, it should be a list of class names or strings, and only objects that are instances of these classes or subclasses of these classes will be returned. Get element before (and not at) a provided offset. This should get w because it was inserted last. But if we give it a lower priority than z then z will appear first. Returns the first encountered element for a given id. Return None if no match. Note: this uses the id attribute stored on elements, which may not be the same as id(e). Return a StreamIterator that will iterate over Elements that match one or more classes in the classFilterList . A single class can also used for the classFilterList parameter instead of a List. Returns a StreamIterator containing all Music21Objects that are found at a certain offset or within a certain offset time range (given the offsetStart and (optional) offsetEnd values). If mustFinishInSpan is True then an event that begins between offsetStart and offsetEnd but which ends after offsetEnd will not be included. The default is False. For instance, a half note at offset 2.0 will be found in getElementsByOffset(1.5, 2.5) or getElementsByOffset(1.5, 2.5, mustFinishInSpan=False) but not by getElementsByOffset(1.5, 2.5, mustFinishInSpan=True). The includeEndBoundary option determines if an element begun just at the offsetEnd should be included. For instance, the half note at offset 2.0 above would be found by getElementsByOffset(0, 2.0) or by getElementsByOffset(0, 2.0, includeEndBoundary=True) but not by getElementsByOffset(0, 2.0, includeEndBoundary=False). Setting includeEndBoundary to False at the same time as mustFinishInSpan is set to True is probably NOT what you want to do unless you want to find things like clefs at the end of the region to display as courtesy clefs. Setting includeElementsThatEndAtStart to False is useful for zeroLength searches that set mustBeginInSpan == False to not catch notes that were playing before the search but that end just before the end of the search type. This setting is ignored for zero-length searches. See the code for allPlayingWhileSounding for a demonstration. This chart, and the examples below, demonstrate the various features of getElementsByOffset. It is one of the most complex methods of music21 but also one of the most powerful, so it is worth learning at least the basics. Return a list of all Elements that do not match the one or more classes in the classFilterList . In lieu of a list, a single class can be used as the classFilterList parameter. Return the first Instrument found in this Stream. Collect all KeySignature objects in this Stream in a new Stream. Optionally search the activeSite stream and/or contexts. Find any elements that overlap. Overlaping might include elements that have zero-length duration simultaneous. This method returns a dictionary, where keys are the start time of the first overlap and value are a list of all objects included in that overlap group. This example demonstrates that end-joing overlaps do not count. Collect all TimeSignature objects in this stream. If no TimeSignature objects are defined, get a default (4/4 or whatever is defined in the defaults.py file). Return True if an element, provided as an argument, is contained in this Stream. This method is based on object equivalence, not parameter equivalence of different objects. Given a single class name as string, return True or False if an element with the specified class is found. Only a single class name can be given. Return a boolean value showing if this Stream contains Measures. Return a boolean value showing if this Stream contains any Parts, or Part-like sub-Streams. Part-like sub-streams are Streams that contain Measures or Notes. And where no sub-stream begins at an offset besides zero. A stream that has a measure in it is not a partlike stream. Adding another though makes it not partlike. If Accidentals.displayStatus is None for all contained pitches, it as assumed that accidentals have not been set for display and/or makeAccidentals has not been run. If any Accidental has displayStatus other than None, this method returns True, regardless of if makeAccidentals has actually been run. Return the first matched index for the specified object. Raises a StreamException if cannot be found. Inserts an item(s) at the given offset(s). The setActiveSite parameter should nearly always be True; only for advanced Stream manipulation would you not change the activeSite after inserting an element. Insert an item at a specified or native offset, and shift any elements found in the Stream to start at the end of the added elements. This presently does not shift elements that have durations that extend into the lowest insert position. Let’s insert an item at the beginning, note that since the C and B are not affected, they do not shift. N.B. – using this method on a list assumes that you’ll be inserting contiguous objects; you can’t shift things that are separated, as this following FAILED example shows. As an FYI, there is no removeAndShift() function, so the opposite of insertAndShift(el) is remove(el, shiftOffsets=True). Insert a Note or Chord into an offset position in this Stream. If there is another Note or Chord in this position, create a new Note or Chord that combines the pitches of the inserted chord. If there is a Rest in this position, the Rest is replaced by the Note or Chord. The duration of the previously-found chord will remain the same in the new Chord. For pieces where the key signature does not change throughout the piece it is MUCH faster than for pieces where the key signature changes. Here in this test, we put Ciconia’s Quod Jactatur (a single voice piece that should have a canon solution: see trecento.quodJactatur) into 3 flats (instead of its original 1 flat) in measure 1, but into 5 sharps in measure 2 and then invert around F4, creating a new piece. Changed in v. 5 – inPlace is False by default. A stream is a sequence if it has no overlaps. Return true if this Stream only employs twelve-tone equal-tempered pitch values. Return True if, given the context of this Stream or Stream subclass, contains what appears to be well-formed notation. This often means the formation of Measures, or a Score that contains Part with Measures. Returns a dict of lists of lyric objects (with the keys being the lyric numbers) found in self. Each list will have an element for each note in the stream (which may be a note.Lyric() or None). By default, this method automatically recurses through measures, but not other container streams. If ignoreBarlines is True, it will behave as if the elements in measures are all in a flattened stream (note that this is not stream.flat as it does not copy the elements) together without measure containers. This means that even if recurse is False, lyrics() will still essentially recurse through measures. If recurse is True, this method will recurse through all container streams and build a nested list structure mirroring the hierarchy of the stream. Note that if ignoreBarlines is True, measure structure will not be reflected in the hierarchy, although if ignoreBarlines is False, it will. Note that streams which do not contain any instance of a lyric number will not appear anywhere in the final list (not as a  or otherwise). Notice that the measures are nested in the part which is nested in the score. Notice that this time, the measure structure is ignored. A method to set and provide accidentals given various conditions and contexts. pitchPast is a list of pitches preceeding this pitch in this measure. pitchPastMeasure is a list of pitches preceeding this pitch but in a previous measure. If useKeySignature is True, a KeySignature will be searched for in this Stream or this Stream’s defined contexts. An alternative KeySignature can be supplied with this object and used for temporary pitch processing. If alteredPitches is a list of modified pitches (Pitches with Accidentals) that can be directly supplied to Accidental processing. These are the same values obtained from a music21.key.KeySignature object using the alteredPitches property. If cautionaryPitchClass is True, comparisons to past accidentals are made regardless of register. That is, if a past sharp is found two octaves above a present natural, a natural sign is still displayed. If cautionaryAll is True, all accidentals are shown. If overrideStatus is True, this method will ignore any current displayStatus stetting found on the Accidental. By default this does not happen. If displayStatus is set to None, the Accidental’s displayStatus is set. If cautionaryNotImmediateRepeat is True, cautionary accidentals will be displayed for an altered pitch even if that pitch had already been displayed as altered. If tiePitchSet is not None it should be a set of .nameWithOctave strings to determine whether following accidentals should be shown because the last note of the same pitch had a start or continue tie. The updateAccidentalDisplay() method is used to determine if an accidental is necessary. This will assume that the complete Stream is the context of evaluation. For smaller context ranges, call this on Measure objects. Return a new Stream, or modify the Stream in place, with beams applied to all notes. TO BE DEPRECATED SOON! Use Chordify instead! Gathers simultaneously sounding Note objects into Chord objects, each of which contains all the pitches sounding together. If useExactOffsets is True (default=False), then do an exact makeChords using the offsets in the piece. If this parameter is set, then minimumWindowSize is ignored. The gathering of elements, starting from offset 0.0, uses the minimumWindowSize , in quarter lengths, to collect all Notes that start between 0.0 and the minimum window size (this permits overlaps within a minimum tolerance). After collection, the maximum duration of collected elements is found; this duration is then used to set the new starting offset. A possible gap then results between the end of the window and offset specified by the maximum duration; these additional notes are gathered in a second pass if includePostWindow is True. The new start offset is shifted to the larger of either the minimum window or the maximum duration found in the collected group. The process is repeated until all offsets are covered. Each collection of Notes is formed into a Chord. The Chord is given the longest duration of all constituents, and is inserted at the start offset of the window from which it was gathered. Chords can gather both articulations and expressions from found Notes using gatherArticulations and gatherExpressions . If transferGroupsToPitches is True, and group defined on the source elements Groups object will be transfered to the Pitch objects conatained in the resulting Chord. The resulting Stream, if not in-place, can also gather additional objects by placing class names in the collect list. By default, TimeSignature and KeySignature objects are collected. Clean this Stream: for self and all elements, purge all dead locations and remove all non-contained sites. Further, restore all active sites. Return a new stream (or if inPlace=True change in place) this Stream so that it has internal measures. For more details, see makeMeasures(). This method calls a sequence of Stream methods on this Stream to prepare notation, including creating voices for overlapped regions, Measures if necessary, creating ties, beams, and accidentals. Changed in v.4., inPlace=False by default. If this Stream has overlapping Notes or Chords, this method will isolate all overlaps in unique Voices, and place those Voices in the Stream. Given a measure number, return a single Measure object if the Measure number exists, otherwise return None. This method is distinguished from measures() in that this method returns a single Measure object, not a Stream containing one or more Measure objects. If this Stream contains Measures, provide an OrderedDict whose keys are the offsets of the start of each measure and whose values are a list of references to the Measure objects that start at that offset. Even in normal music there may be more than one Measure starting at each offset because each Part might define its own Measure. However, you are unlikely to encounter such things unless you run Score.semiFlat, which retains all the containers found in the score. The offsets are always measured relative to the calling Stream (self). You can specify a classFilterList argument as a list of classes to find instead of Measures. But the default will of course find Measure objects. Example 1: This Bach chorale is in 4/4 without a pickup, so as expected, measures are found every 4 offsets, until the weird recitation in m. 7 which in our edition lasts 10 beats and thus causes a gap in measureOffsetMap from 24.0 to 34.0. Get a region of Measures based on a start and end Measure number where the boundary numbers are both included. That is, a request for measures 4 through 10 will return 7 Measures, numbers 4 through 10. While all elements in the source are the original elements in the extracted region, new Measure objects are created and returned. To get all measures from the beginning, go ahead and always request measure 0 to x, there will be no error if there is not a pickup measure. if indicesNotNumbers is True, then it ignores defined measureNumbers and uses 0-indexed measure objects and half-open range. For instance, if you have a piece that goes “m1, m2, m3, m4, …” (like a standard piece without pickups, then .measures(1, 3, indicesNotNumbers=True) would return measures 2 and 3, because it is interpreted as the slice from object with index 1, which is measure 2 (m1 has index 0) up to but NOT including the object with index 3, which is measure 4. IndicesNotNumbers is like a Python-slice. if gatherSpanners is True then all spanners in the score are gathered and included. TODO: make True only return spanners from the region. Use core.gatherMissingSpanners() to do so. Returns a Stream of Interval objects between Notes (and by default, Chords) that follow each other in a stream. the offset of the Interval is the offset of the beginning of the interval (if two notes are adjacent, then this offset is equal to the offset of the second note, but if skipRests is set to True or there is a gap in the Stream, then these two numbers will be different). See findConsecutiveNotes() in this class for a discussion of what is meant by default for “consecutive notes”, and which keywords such as skipChords, skipRests, skipUnisons, etc. can be used to change that behavior. The interval between a Note and a Chord (or between two chords) is the interval to the first pitch of the Chord (pitches) which is usually the lowest. For more complex interval calculations, run findConsecutiveNotes() and then calculate your own intervals directly. Returns an empty Stream if there are not at least two elements found by findConsecutiveNotes. Merge relevant attributes from the Other stream into this one. Given another Stream, store references of each element in the other Stream in this Stream. This does not make copies of any elements, but simply stores all of them in this Stream. Optionally, provide a list of classes to exclude with the classFilter list. This method provides functionality like a shallow copy, but manages locations properly, only copies elements, and permits filtering by class type. Return a list of offset start, offset end, MetronomeMark triples for all TempoIndication objects found in this Stream or a Stream provided by srcObj. If no MetronomeMarks are found, or an initial region does not have a MetronomeMark, a mark of quarter equal to 120 is provided as default. Returns a list where each element is a NamedTuple consisting of the ‘offset’ of each element in a stream, the ‘endTime’ (that is, the offset plus the duration) and the ‘element’ itself. Also contains a ‘voiceIndex’ entry which contains the voice number of the element, or None if there are no voices. The Stream source of elements is self by default, unless a srcObj is provided. Given an element (from another Stream) returns the single element in this Stream that is sounding while the given element starts. If there are multiple elements sounding at the moment it is attacked, the method returns the first element of the same class as this element, if any. If no element is of the same class, then the first element encountered is returned. For more complex usages, use allPlayingWhileSounding. Returns None if no elements fit the bill. Given a method and keyword configuration arguments, create and display a plot. Note: plot() requires the Python package matplotib to be installed. For details on arguments this function takes, see User’s Guide, Chapter 22: Graphing. Return and remove the object found at the user-specified index value. Index values are those found in elements and are not necessary offset order. Quantize time values in this Stream by snapping offsets and/or durations to the nearest multiple of a quarter length value given as one or more divisors of 1 quarter length. The quantized value found closest to a divisor multiple will be used. The quarterLengthDivisors provides a flexible way to provide quantization settings. For example, (2,) will snap all events to eighth note grid. (4, 3) will snap events to sixteenth notes and eighth note triplets, whichever is closer. (4, 6) will snap events to sixteenth notes and sixteenth note triplets. If quarterLengthDivisors is not specified then defaults.quantizationQuarterLengthDivisors is used. The default is (4, 3). processOffsets determines whether the Offsets are quantized. processDurations determines whether the Durations are quantized. Both are set to True by default. Setting both to False does nothing to the Stream. if inPlace is True then the quantization is done on the Stream itself. If False (default) then a new quantized Stream of the same class is returned. If recurse is True then all substreams are also quantized. If False (TODO: MAKE default) then only the highest level of the Stream is quantized. Returns an iterator that iterates over a list of Music21Objects contained in the Stream, starting with self (unless skipSelf is True), continuing with self’s elements, and whenever finding a Stream subclass in self, that Stream subclass’s elements. Here’s an example. Let’s create a simple score. Notice that like calling .show(‘text’) , the offsets are relative to their containers. If you don’t need correct offsets or activeSites, set restoreActiveSites to False . Then the last offset/activeSite will be used. It’s a bit of a speedup, but leads to some bad code, so use it only in highly optimized situations. 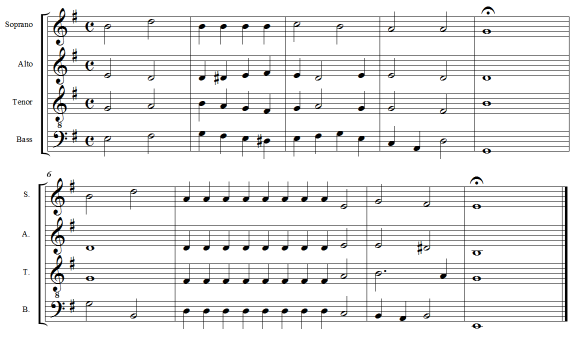 We’ll also test using multiple classes here… the Stream given is the same as the s.flat.notes stream. So, this is pretty unreliable so don’t use it unless the tiny speedup is worth it. The other two attributes are pretty self-explanatory: streamsOnly will put only Streams in, while includeSelf will add the initial stream from recursion. If the inclusion or exclusion of self is important to you, put it in explicitly. Remember that like all iterators, it is dangerous to alter the components of the Stream being iterated over during iteration. if you need to edit while recusing, list(s.recurse()) is safer. Changed in v5.5 – skipSelf is True as promised. All attributes are keyword only. includeSelf is added and now preferred over skipSelf . skipSelf will be removed in or after 2022. Remove an object from this Stream. Additionally, this Stream is removed from the object’s sites in Sites. If a list of objects is passed, they will all be removed. If shiftOffsets is True, then offsets will be corrected after object removal. It is more efficient to pass a list of objects than to call remove on each object individually if shiftOffsets is True. No error is raised if the target is not found. With the recurse=True parameter, we can remove elements deeply nested. However, shiftOffsets does not work with recurse=True yet. Remove all elements from the Stream based on one or more classes given in a list. Test that removing from end elements works. Remove all elements not of the specified class or subclass in the Steam in place. Given an object and a number, run append that many times on a deepcopy of the object. numberOfTimes should of course be a positive integer. Given a target object, replace it with the supplied replacement object. Does nothing if target cannot be found. If allDerived is True (as it is by default), all sites that have a reference for the replacement will be similarly changed. This is useful for altering both a flat and nested representation. recurse is currently buggy and in beta. firstMatchOnly did NOTHING because each element can only be in a site ONCE. Removed! allTargetSites RENAMED to allDerived – only searches in derivation chain. Restore all active sites for all elements from this Stream downward. Scale all durations by a provided scalar. Offsets are not modified. To augment or diminish a Stream, see the augmentOrDiminish() method. We do not retain durations in any circumstance; if inPlace=True, two deepcopies are done which can be quite slow. Scale all offsets by a multiplication factor given in amountToScale . Durations are not altered. The anchorZero parameter determines if and/or where the zero offset is established for the set of offsets in this Stream before processing. Offsets are shifted to make either the lower or upper values the new zero; then offsets are scaled; then the shifts are removed. Accepted values are None (no offset shifting), “lowest”, or “highest”. The anchorZeroRecurse parameter determines the anchorZero for all embedded Streams, and Streams embedded within those Streams. If the lowest offset in an embedded Stream is non-zero, setting this value to None will a the space between the start of that Stream and the first element to be scaled. If the lowest offset in an embedded Stream is non-zero, setting this value to ‘lowest’ will not alter the space between the start of that Stream and the first element to be scaled. To shift all the elements in a Stream, see the shiftElements() method. Changed in v.5 – inPlace is default False, and anchorZero, anchorZeroRecurse and inPlace are keyword only arguments. Sets the .derivation.method for each element in the Stream if it has a .derivation object. Sets the Offset for an element, very quickly. <music21.note.Note D>, not in Stream <music21.stream.Stream Stream1>. Add the given offset value to every offset of the objects found in the Stream. Objects that are specifically placed at the end of the Stream via .storeAtEnd() (such as right barlines) are not affected. N.B. score.write(‘lily’) returns a bare lilypond file, score.show(‘lily’) runs it through lilypond and displays it as a png. Takes a part within the score and a list of variant groups within that part. Puts the variant object in a part surrounded by hidden rests to mimic the appearence of an ossia despite limited musicXML support for ossia staves. Note that this will ignore variants with .lengthType ‘elongation’ and ‘deletion’ as there is no good way to represent ossia staves like those by this method. >>> sPartStr = "d4 e4 f4 g4   a2 b-4 a4    g4 a8 g8 f4 e4    d2 a2 "
>>> v1Str =    "              a2. b-8 a8 "
>>> v2Str =    "                                             d4 f4 a2 "
>>> sPartStr += "d4 e4 f4 g4    a2 b-4 a4    g4 a8 b-8 c'4 c4    f1"
>>> sPartStream.makeMeasures(inPlace=True) # maybe not necessary? returns an ordered list of offsets where elements are started (attacked) at the same time in both self and stream2. Given a list of quarter lengths, slice and optionally tie all Music21Objects crossing these points. Slice all elements in the Stream that have a Duration at the offsets determined to be the beat from the local TimeSignature. Slice all Duration objects on all Notes and Rests of this Stream. Duration are sliced according to the approximate GCD found in all durations. Slice all Duration objects on all Notes and Rests of this Stream. Duration are sliced according to values provided in quarterLengthList list. If the sum of these values is less than the Duration, the values are accumulated in a loop to try to fill the Duration. If a match cannot be found, an Exception is raised. If target is None, the entire Stream is processed. Otherwise, only the element specified is manipulated. Sort this Stream in place by offset, then priority, then standard class sort order (e.g., Clefs before KeySignatures before TimeSignatures). If force is True, a sort will be attempted regardless of any other parameters. This method overrides the method on Music21Object to provide similar functionality for Streams. Most arguments are passed to Music21Object.splitAtQuarterLength. Given a stream, get all objects of type classObj and divide them into two new streams depending on the results of fx. Fx should be a lambda or other function on elements. All elements where fx returns True go in the first stream. All other elements are put in the second stream. If classObj is None then all elements are returned. ClassObj can also be a list of classes. In this example, we will create 50 notes from midi note 30 (two octaves and a tritone below middle C) to midi note 80 (an octave and a minor sixth above middle C) and add them to a Stream. We then create a lambda function to split between those notes below middle C (midi note 60) and those above (google “lambda functions in Python” for more information on what these powerful tools are). Inserts an item or items at the end of the Stream, stored in the special box (called _endElements). As sorting is done only by priority and class, it cannot avoid setting isSorted to False. Only elements of zero duration can be stored. Otherwise a StreamException is raised. Find all notes that are tied; remove all tied notes, then make the first of the tied notes have a duration equal to that of all tied constituents. Lastly, remove the formerly-tied notes. This method can be used on Stream and Stream subclasses. When used on a Score, Parts and Measures are retained. If retainContainers is False (by default), this method only returns Note objects; Measures and other structures are stripped from the Stream. Set retainContainers to True to remove ties from a Part Stream that contains Measure Streams, and get back a multi-Measure structure. In some cases (under makeMeasures()) a continuation note will not have a Tie object with a stop attribute set. In that case, we need to look for sequential notes with matching pitches. The matchByPitch option can be used to use this technique. Note that inPlace=True on a Stream with substream currently has buggy behavior. Use inPlace=False for now. Return a new Stream based on this one, but with If this Stream contains measures, return a new Stream with new Measures populated with the same characteristics of those found in this Stream. That is, TimeSignatures, KeySignatures, etc. are retained. If not at sounding pitch, transpose all Pitch elements to sounding pitch. The atSoundingPitch property is used to determine if transposition is necessary. If not at written pitch, transpose all Pitch elements to written pitch. The atSoundingPitch property is used to determine if transposition is necessary. Transfer the offset of this stream to all internal elements; then set the offset of this stream to zero. Transpose all specified classes in the Stream by the user-provided value. If the value is an integer, the transposition is treated in half steps. If the value is a string, any Interval string specification can be provided. returns a new Stream by default, but if the optional “inPlace” key is set to True then it modifies pitches in place. TODO: for generic interval set accidental by key signature. If this Stream defines one or more voices, extract each into a Part, returning a Score. If this Stream has no voices, return the Stream as a Part within a Score. If separateById is True then all voices with the same id will be connected to the same Part, regardless of order they appear in the measure. Note that the second and subsequent measure’s pitches were changed not the first, because separateById aligns the voices according to order first encountered, not by sorting the Ids. Write out a file of music notation (or an image, etc.) in a given format. If fp is specified as a file path then the file will be placed there. If it is not given then a temporary file will be created. If fmt is not given then the default of your Environment’s ‘writeFormat’ will be used. For most people that is musicxml. Returns the full path to the file. Boolean describing whether the Stream is automatically sorted by offset whenever necessary. Boolean describing whether this Stream contains embedded sub-Streams or Stream subclasses (not flat). Boolean describing whether the Stream is sorted or not. String of (‘elementsFirst’ (default), ‘flatten’, ‘elementsOnly) that decides whether the stream likely holds relevant contexts for the elements in it. Define this for a stream class, not an individual object. A representation of a Measure organized as a Stream. All properties of a Measure that are Music21 objects are found as part of the Stream’s elements. Return the bar duration, or the Duration specified by the TimeSignature, regardless of what elements are found in this Measure or the highest time. TimeSignature is found first within the Measure, or within a context based search. To get the duration of the total length of elements, just use the .duration property. Here we create a 3/4 measure and “over-stuff” it with five quarter notes. barDuration still gives a duration of 3.0, or a dotted quarter note, while .duration gives a whole note tied to a quarter. Get or set the left barline, or the Barline object found at offset zero of the Measure. Can be set either with a string representing barline style or a bar.Barline() object or None. Note that not all bars have barline objects here – regular barlines don’t need them. Get or set the right barline, or the Barline object found at the offset equal to the bar duration. Return a floating point value greater than 0 showing the proportion of the bar duration that is filled based on the highest time of all elements. 0.0 is empty, 1.0 is filled; 1.5 specifies of an overflow of half. Bar duration refers to the duration of the Measure as suggested by the TimeSignature . This value cannot be determined without a TimeSignature . An already-obtained Duration object can be supplied with the barDuration optional argument. Note: this does not yet accommodate triplets. But there is no TimeSignature! So, we get the best Time Signature and put it in the Stream. This method calls a sequence of Stream methods on this Measure to prepare notation. Return the measure .number with the .numberSuffix as a string. Note that we use print here because in parsing the data will become a unicode string. Given another Measure, configure all non-element attributes of this Measure with the attributes of the other Measure. No elements will be changed or copied. This method is necessary because Measures, unlike some Streams, have attributes independent of any stored elements. Given an incompletely filled Measure, adjust the paddingLeft value to to represent contained events as shifted to fill the right-most duration of the bar. Calling this method will overwrite any previously set paddingLeft value, based on the current TimeSignature-derived barDuration attribute. And the rest is gone! Boolean describing if the Clef is different than the previous Measure. Boolean describing if KeySignature is different than the previous Measure. A suggestion for layout width, though most rendering systems do not support this designation. Use SystemLayout objects instead. A number representing the displayed or shown Measure number as presented in a written Score. If a Measure number has a string annotation, such as “a” or similar, this string is stored here. Note that in MusicXML, such suffixes often appear as prefixes to measure numbers. In music21 (like most measure numbering systems), these numbers appear as suffixes. Boolean describing if the TimeSignature is different than the previous Measure. A Stream subclass for designating music that is considered a single part. When put into a Score object, Part objects are all collected in the Score.parts call. Otherwise they mostly work like generic Streams. Generally the hierarchy goes: Score > Part > Measure > Voice, but you are not required to stick to this. Part groupings (piano braces, etc.) are found in the music21.layout module in the StaffGroup Spanner object. Gets or sets a string representing the abbreviated name of this part as a whole (not counting instrument changes, etc.). Note that changing an instrument’s .partAbbreviation or .instrumentAbbreviation while it is already in the Stream will not automatically update this unless .coreElementsChanged() is called or this Stream’s elements are otherwise altered. This is because the value is cached so that O(n) searches through the Stream do not need to be done every time. Gets or sets a string representing the name of this part as a whole (not counting instrument changes, etc.). Note that changing an instrument’s .partName or .instrumentName while it is already in the Stream will not automatically update this unless .coreElementsChanged() is called or this Stream’s elements are otherwise altered. This is because the value is cached so that O(n) searches through the Stream do not need to be done every time. This overridden method of Stream.makeAccidentals provides the management of passing pitches from a past Measure to each new measure for processing. A Stream subclass for handling multi-part music. Almost totally optional (the largest containing Stream in a piece could be a generic Stream, or a Part, or a Staff). And Scores can be embedded in other Scores (in fact, our original thought was to call this class a Fragment because of this possibility of continuous embedding; though it’s probably better to embed a Score in an Opus), but we figure that many people will like calling the largest container a Score and that this will become a standard. Return all Part objects in a Score. It filters out all other things that might be in a Score object, such as Metadata returning just the Parts. Expand all repeats, as well as all repeat indications given by text expressions such as D.C. al Segno. This method always returns a new Stream, with deepcopies of all contained elements at all level. Given a Score, combine all Parts into a single Part with all elements found in each Measure of the Score. The classFilterList can be used to specify which objects contained in Measures are transferred. It also flattens all voices within a part. Reduce a polyphonic work into two staves. Currently, this is just a synonym for partsToVoices with voiceAllocation = 2 , and permitOneVoicePerPart = False , but someday this will have better methods for finding identical parts, etc. This method overrides the makeNotation method on Stream, such that a Score object with one or more Parts or Streams that may not contain well-formed notation may be transformed and replaced by well-formed notation. Given a measure number (or measure index, if indicesNotNumbers is True) return another Score object which contains multiple parts but each of which has only a single Measure object if the Measure number exists, otherwise returns a score with parts that are empty. This way the original measure objects can be returned without being altered. This Score method overrides the measureOffsetMap() method of Stream. This creates a map based on all contained Parts in this Score. Measures found in multiple Parts with the same offset will be appended to the same list. If no parts are found in the score, then the normal measureOffsetMap() routine is called. This method is smart and does not assume that all Parts have measures with identical offsets. This method overrides the measures() method on Stream. This creates a new Score stream that has the same measure range for all Parts. Given a multi-part Score, return a new Score that combines parts into voices. The voiceAllocation parameter sets the maximum number of voices per Part. The permitOneVoicePerPart parameter, if True, will encode a single voice inside a single Part, rather than leaving it as a single Part alone, with no internal voices. Slice all duration of all part by the minimum duration that can be summed to each concurrent duration. Overrides method defined on Stream. A Stream subclass for handling multi-work music encodings. Many ABC files, for example, define multiple works or parts within a single file. Opus objects can contain multiple Score objects, or even other Opus objects! Return a list of all numbers defined in this Opus. Get Score objects from this Stream by number. Performs title search using the search() method, and returns the first result. Get Score objects from this Stream by a title. Performs title search using the search() method, and returns the first result. Some Opus objects represent numerous scores that are individual parts of the same work. This method will treat each contained Score as a Part, merging and returning a single Score with merged Metadata. This method overrides the behavior specified in Music21Object for all formats besides explicit lily.x calls. or when running under IPython notebook. Displays an object in a format provided by the fmt argument or, if not provided, the format set in the user’s Environment. This method overrides the behavior specified in Music21Object for all formats besides explicit lily.x calls. A Part subclass for designating music that is represented on a single staff but may only be one of many staves for a single part. For advanced use. This Stream subclass is only used inside of a Spanner object to provide object storage of connected elements (things the Spanner spans). This subclass name can be used to search in an object’s .sites and find any and all locations that are SpannerStorage objects. A spannerParent keyword argument must be provided by the Spanner in creation. Totally optional and used only in OMR and Capella: a designation that all the music in this Stream belongs in a single system. The system object has two attributes, systemNumber (which number is it) and systemNumbering which says at what point the numbering of systems resets. It can be either “Score” (default), “Opus”, or “Page”.